If you’re the parent or caregiver of a child with autism spectrum disorder, sensory processing disorder, obsessive compulsive disorder, and/or anxiety, you know the importance of having whole-body calming strategies at your disposal to help your little one calm and regulate her body when she feels overwhelmed, and today I want to share a fabulous tool that can help you teach your child to self-regulate when big emotions threaten to take over. It’s called a calm down jar, and while it may sound simple and insignificant, it can make all the difference in helping your child transition from co-regulation to self-regulation when she feels overwhelmed. I’ve seen several ‘how to make a calm down jar’ pins in my Pinterest feed over the last few years, but it wasn’t until a couple of months ago that I took the time to fully understand why they are so effective and how they can help prevent a meltdown from occurring (and help calm emotions faster when they do). And that’s where calm down jars come in. So, What Is a Calm Down Jar? Simply put, it’s a jar filled with glitter, glue, and water, as well as any other props that appeal to your child, and while they are effective in soothing pretty much anyone, they are especially useful for kids with ASD, SPD, OCD, and anxiety as they help decrease anxiety and fear while also helping with anger management. The act of shaking and watching the contents of a calm down jar settle forces the body to focus, which in turn allows your child to organize her thoughts and ‘center’ her nervous system. The idea is that, as the items within the calm down jar fall, so will your child’s heart rate and rapid breathing, allowing her to gain control over her emotions. How Do I Use a Calm Down Jar to Calm My Child? In order for a calm down jar to work, it’s important to introduce it to your child before she’s upset so she understands what it is and how it works. Shake it up, give it to her, and see what she does! If she likes it and you find it soothes her, keep it on hand and give it to her the next time she feels overwhelmed, and continue using it each time her emotions are running high. This is called co-regulation as you are the one initiating her use of the calm down jar, but over time, your child will hopefully transition to self-regulation by asking or reaching for it when she’s feeling anxious, scared, or angry. Teach Me How to Make a Calm Down Jar! While you can buy calm down jars online, learning how to make a calm down jar yourself is surprisingly easy and it’s fun to add a little bit of personalization for your child. Here’s a list of simple instructions to teach you how to make a calm down jar from scratch! 2. Mix glitter glue with hot water and a few drops of food coloring and whisk vigorously until the glue ‘melts’ and mixes properly with the water. To be honest, I didn’t follow a specific glue/water ratio when I made mine. I just sort of threw it all together and hoped for the best, but you can adjust to your preference. 3. Add additional glitter, whisk vigorously one more time, and transfer mixture into your clear jar. 4. If your jar isn’t 100% full, top up with hot water. 5. Allow water to cool to room temperature before putting the lid on. 6. Secure lid with glue (I used a glue gun) to ensure it is properly sealed and won’t leak. What Other Things Can I Add To My Child’s Calm Down Jar? 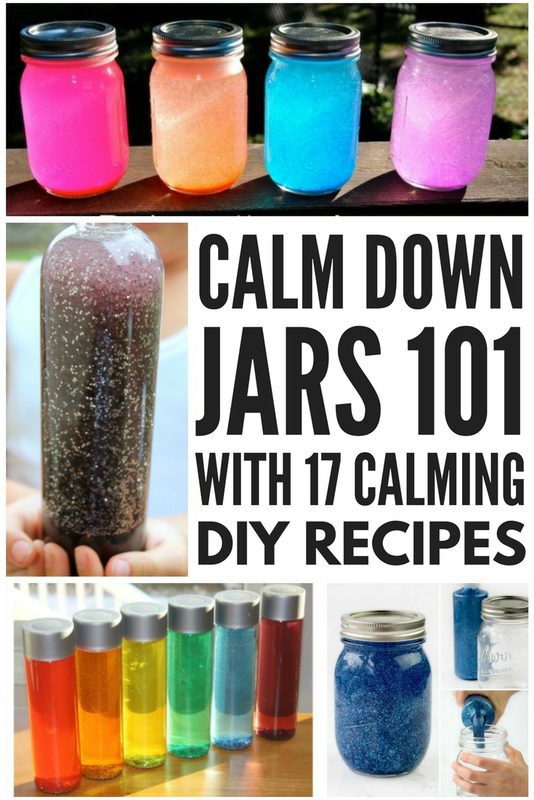 There are HEAPS of different calm down jar variations you can make to appeal to the interests of your individual child, and not all of them have to have glitter in them. We’ve rounded up 17 of our favorites below! Learning how to make a calm down jar is not only fun, but it can also make a world of difference in teaching your child how to self-regulate. And since they are pretty and portable, calm down jars are an excellent tool to help children with ASD, SPD, OCD, and anxiety calm down when they’re on the go. Keep one in your purse, in your car, and in your child’s school backpack! If you found these tips to teach you how to make a calm down jar helpful, please share them on Pinterest! And if you’re looking for more tips and tricks for kids with special needs, please follow our Autism board, where we share all kinds of fabulousness strategies and ideas!